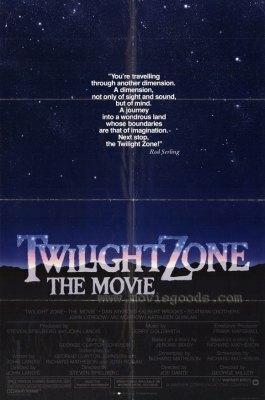 When it opened in June 1983, Twilight Zone - The Movie was greeted with a mix of enormous enthusiasm and disappointment. The 1959-64 television series was still widely airing in syndication; many markets were at the time running two episodes back-to-back, often on weeknights after 11:00pm, and by then the best shows were firmly ingrained in the public consciousness. The movie hedged its bets by remaking three of the more popular shows (significantly, none were based on Rod Serling scripts) while the one original segment was clouded by a real-life tragedy. During production the previous summer, actor Vic Morrow and two small children died in an unspeakably grisly accident; segment director John Landis and four others were charged with involuntary manslaughter in a case still in the courts as Twilight Zone - The Movie went into release. If you saw the movie that summer, it was impossible to watch it and not feel the weight of that horrible tragedy permeate every minute of the Landis/Morrow segment. The rest of the picture is a mixed bag, and rarely does it capture the essence of what made The Twilight Zone a great series. More often than not it resembles something else entirely. The key difference is that on the TV show the writers were the stars: memorable episodes like "Time Enough at Last" and "The Invaders" were "Rod Serling" or "Richard Matheson shows" and not remembered for their directors, John Brahm and Douglas Heyes, respectively, even though they and others did excellent work that certainly contributed to their overall success. The four segments in Twilight Zone - The Movie by and large are director vehicles, and their respective styles rather than the scripts or their characters dominate, generally to bad effect. The movie opens with an amusing but misguided prologue also written and directed by Landis, though it probably was fine-tuned by co-star Albert Brooks. (Similarly, the movie begins with Creedence Clearwater Revival's "The Midnight Special" heard over the Warner Bros. logo, which was met with a collective "Huh?" from movie audiences.) Brooks's traveler picks up hitchhiker Dan Aykroyd and their discussion eventually turns to TV theme songs and, eventually, specific episodes of The Twilight Zone TV series. It's quite funny (best line: trying to identify Aykroyd's humming of the "Theme from Hawaii Five-O," Brooks blurts out, "It sounds like it was on CBS!") but, ironically, for all its talk of the original show, the sting in its tail is much less in the spirit of Twilight Zone than creator Rod Serling's mostly dreary '70s follow-up, Night Gallery. Moreover the emphasis is on how "scary" Twilight Zone was; while that's true of some episodes, it misunderstands the show's real appeal. Ironically, Landis's main segment - with Vic Morrow playing an angry bigot sent back through time to experience the plight of the Jews under the Nazis in Occupied France, blacks at a lynching in 1960s Alabama, and Vietnamese civilians during that war - comes closet to Serling's metier. It even cribs directly from his grab-bag of recycled cliches: Morrow's Bill Connor "has a chip on his shoulder the size of the national debt," etc. What I suppose was intended as a kind of "poetic justice" piece has no impact at all because Connor's time-tripping gets underway before we get to know much about the character; he gets a taste of his own medicine, and in the end is shipped off into other-dimensional oblivion. The End. It's entirely possible that Landis had intended a different ending to the segment before Morrow's untimely death; the TV series more often than not was about giving characters second chances, so maybe that's what Landis originally had in mind. Steven Spielberg's segment is next, a remake of George Clayton Johnson's teleplay for "Kick the Can," adapted here by Richard Matheson and Melissa Mathison, fresh from her screenplay to E.T. In both the TV and film versions, a group of senior citizens are given the chance to literally recapture their youth, to become children again after they sneak away from their nursing home beds and go off into the night to play "kick the can." Universally trounced by critics, the piece conjures up every Spielbergian cliche imaginable: bathing its characters in warm, red-orange light, the slow tracking shots into tight close-ups for maximum emotional impact, unbearably precocious kids (as the younger versions of equally precocious seniors). It plays like a Cliff Notes version of E.T., or maybe Hook while showing absolutely no understanding of the real concerns of the elderly. Beyond its unearned sentiment, the piece makes the mistake of changing concepts in the original script it should have retained, while retaining other elements that should have been jettisoned. For example, it would have been better served if the "Sunnyvale Rest Home" had approached something like the conditions in a real world, modern-day nursing home, one of those horrible dumping grounds that would have given its characters a realistic, urgent need to get the hell out, instead of the homogenized, even idealized Main Street U.S.A. Disneyland-style facility they instead live in. (Would that all senior citizens be so lucky.) Spielberg insists on making its residents unbearably cute, especially its stereotyped Old Jewish Couple (Selma Diamond and Martin Garner; he's like something out of Car 54, Where Are You?) and even cuter kids. Scatman Crothers is an inspired choice as the new resident who stirs up feelings of lost youth among the residents, and Jerry Goldsmith's atypically John Williams-esque score is exceptional, better than the segment deserves, but the whole thing's a syrupy disaster. Joe Dante's segment, a re-imagining of Jerome Bixby's "It's a Good Life," of the best TV episodes, was singled out for praise, but like Spielberg's piece it sacrifices characterization and storytelling in favor of its own starkly visual design. A young woman (Kathleen Quinlan) picks up a strange, lonely boy, Anthony (Jeremy Licht in a stiff, not believable performance), who takes her to his otherworldly home out in the middle of nowhere, where the boy's seemingly unlimited supernatural powers terrify four people (Kevin McCarthy, William Schallert, Patricia Barry, and a pre-Bart Simpson Nancy Cartwright) to the brink of madness. Again adapted by Matheson with obvious input from Dante, this version earns points for trying to take its familiar story in a new direction, here supposing that a child with unlimited powers might fashion a cocooned, freaky world based on classic cartoons: his house is a duplicate of one seen in the Chuck Jones one-reeler Feed the Kitty, while its second floor looks like something out of Max and Dave Fleischer's black & white cartoons. The segment opts for a darkly humorous tone rather than the despairing one of the original TV version, and McCarthy's deliriously unhinged performance especially does a good job at selling this. The characters played by Quinlan and Licht get lost in the jumble, however. She seems to exist solely to react to the other characters' strange behavior, while Licht's 11-year-old Anthony is curiously unformed. He's clearly not the (at times) sadistic four-year-old monster Billy Mumy was in the TV version, the monster any child of that age might become armed with the power to indulge his every whim. The movie-Anthony is, I guess, supposed to be sympathetic in a way his TV counterpart never was, but it's an approach that doesn't work, and this is exemplified in the segment's wholly unsatisfactory ending. As Dante likes to do with his films, his adaptation is crammed with movie and TV references and positively choking with veterans from the TV series and other character actor favorites, and while this is a feast for nostalgia buffs to some degree it further detracts from the segment's effectiveness. Fortunately the final segment, though also a remake, is the movie's single unqualified success. Adapting his own short story and fifth season Twilight Zone favorite, Richard Matheson makes some interesting changes to "Nightmare at 20,000 Feet," notably transforming the original's married, newly-released mental patient (played by William Shatner), to an ordinary, unmarried man traveling alone who happens to suffer from severe aviotophobia - fear of flying. Already rattled by turbulence and a parade of grotesque passengers sitting nearby (there's an implication that these characters are exaggerated by his mental state), John Valentine (John Lithgow) is horrified to see some shadowy, man-shaped figure on the wing of the plane. Some have criticized the segment for making Valentine unhinged from the get-go, and/or suggested that the segment is overly explicit compared with the TV version. The latter charge is simply untrue. Matheson himself complained that the otherwise excellent TV version erred in showing the monster all too clearly (and that it resembled a giant panda). As directed by George Miller (the Australian director of The Road Warrior, not the Scottish filmmaker), the gremlin in the movie is barely discernable until the segment is almost over, and not overused when it finally is revealed in close-up. Twilight Zone - The Movie is presented in a 16:9 enhanced transfer at 1.78:1 that approximates the film's 1.85:1 original theatrical aspect ratio. The image is sharp and the colors accurate to its original release. The remastered 5.1 Dolby Digital audio is superb with aggressive directionality, notably in Burgess Meredith's opening narration. French and Spanish audio, along with English, Portuguese and Chinese subtitles are included. The only supplement is a teaser trailer with no scenes from the movie. Obviously, the movie is still, all these years later, an open wound at Warner Bros.** It would have been impossible to create an audio commentary or new featurette without addressing (or glossing over) the tragedy of Vic Morrow and the two children, Renee Chen and My-ca Dinh Le, so the studio has opted for a bare-bones release, an appropriate decision. Like the guardians of little Anthony, Twilight Zone - The Movie makes the mistake of indulging its directors rather than concentrate on the writing, which was always the original TV show's greatest strength. For what it is the movie version isn't bad but with a bit more care could have been so much better. * One of its seemingly over-the-top moments, where Valentine opens a newspaper with a banner headline about huge airline disaster, actually happened on a flight to this reviewer. I couldn't believe stewardesses were casually handing out copies of that day's paper. ** When I worked at Warner Bros.'s Corporate Image Archives back around 1999, all contact sheets and other on-set photographs were locked away in a vault in Warner's legal department, so terrified were they that images from the Landis/Morrow segment would be leaked. Film historian Stuart Galbraith IV's most recent essays appear in Criterion's new three-disc Seven Samurai DVD and BCI Eclipse's The Quiet Duel.